Santa's real post office exists, and it’s in Lapland, Finland. So if you have a word or two to share with him before Christmas, be sure to start writing, and he will read it before taking off with Rudolf the Red-Nosed Reindeer. Santa Claus’ Main Post Office is situated at Santa Claus Village in Rovaniemi, Finland, where Santa opens his doors to the public every day of the year. 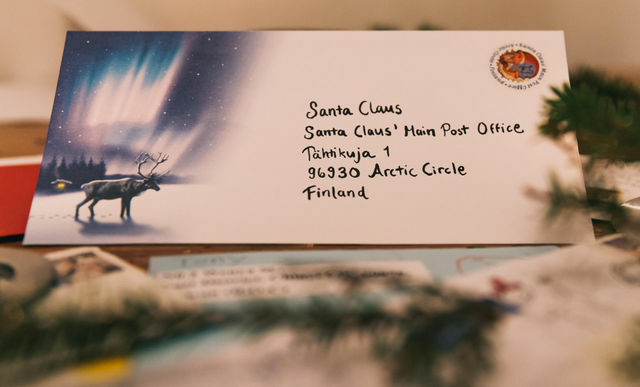 His Post Office, maintained by the Finnish Posti Group Corporation, is not an ordinary one: every year, around 500 000 letters arrive from every corner of the world addressed to a particular person: Santa Claus himself. And they arrive every single day! Most of the letters that Santa receives are written by children, but sending a letter to Santa is definitely not limited to the small and pink-cheeked. Santa's Post elves have revealed that even politicians and pop stars write to him. So why not you? You can be sure the hard-working elves will get that letter straight to the Big Guy himself! The Post Office, as well as Santa's Office, are great places to visit throughout the year too. Every year, half a million people step in to enjoy the genuine Christmas feeling, and maybe send their greetings back home with an authentic Santa's Post Office stamp on their letters. So if you plan to go to Rovaniemi, be sure not to miss that exciting opportunity!